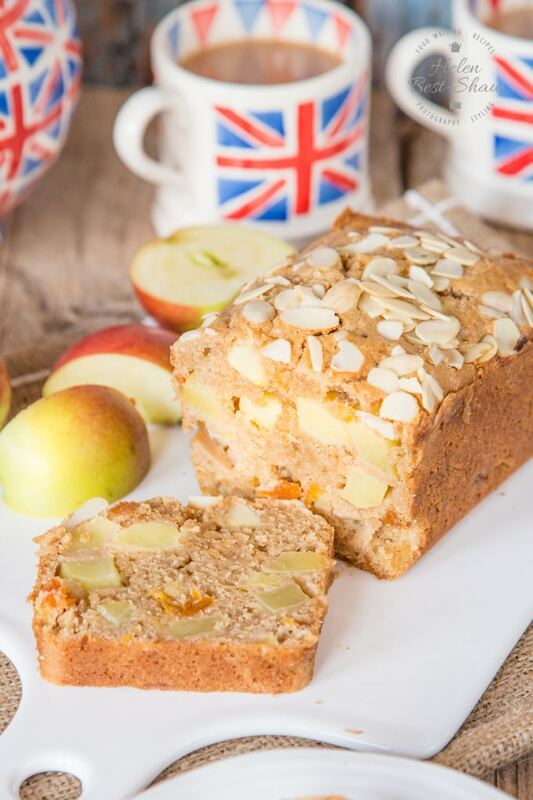 This easy Dorset apple cake is simple to make, delicious, packed with flavour with chunks of apple and dried fruit. No mixing machine needed! Add a dollop of cream for a real treat with this classic British bake. Why the Rubbing In Method to Make this Loaf Cake? This traditional Dorset apple cake is an easy recipe, with delicious results; the chunks of apple guarantee that it won’t be dry. 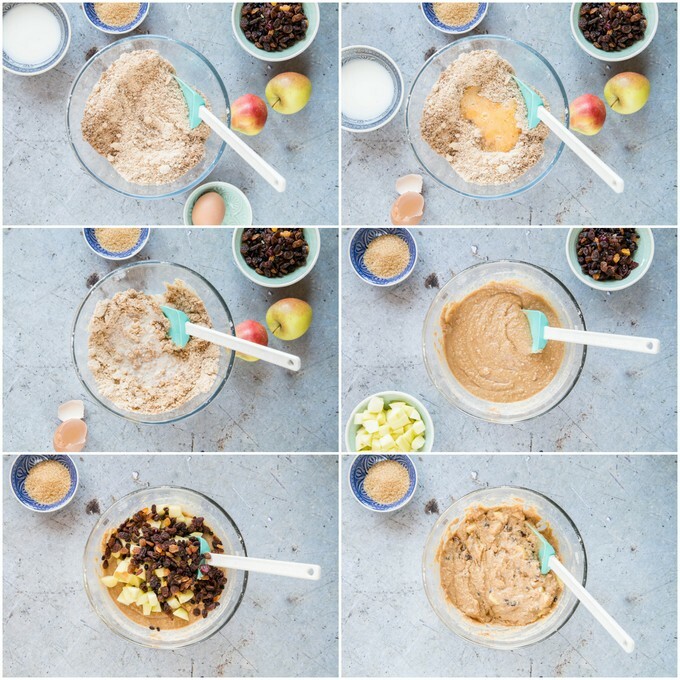 It’s easy to make by hand, and there’s no need for a mixer. British baking at its best! I love simple fuss-free cakes like this which are all about the flavour without the need to decorate. If you want to, you can sprinkle some sliced almonds on top just to finish it off! It’s a great way of using up apples in an autumnal glut. A sharply flavoured eating apple is best for this recipe, to contrast with the sugar in the batter. Bramley apples go soft and fluffy when cooked, which means that the chunks would collapse inside the cake once it’s baked. This is why it’s best to use an eating apple. Because of the chunks of fruit this cake won’t keep for that long, store in an airtight tin for 2 days, or wrapped in foil in the fridge for 4. Firstly heat the oven to 160°C (Fan)/320°F (Fan)/gas mark 4. 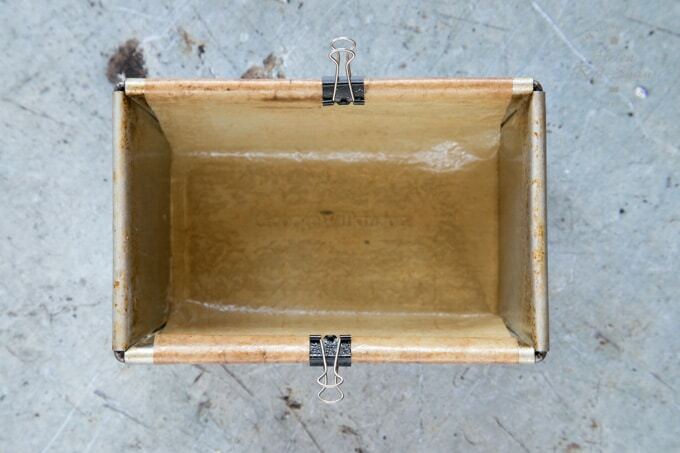 Grease and line a 1lb (15cm) loaf tin with butter or cake release spray and baking parchment. Step two – sift the flour into a bowl, add the cinnamon and baking powder and mix together. Step three – cut the butter into small cubes and add to the flour. Step four – rub in the butter using your finger tips, until the mixture is the consistency of fine breadcrumbs or damp sand. This will take a good few minutes. Step five – stir in the sugar. Step six – beat the egg lightly and fold into the mixture. Step seven – add the milk and fold it in. Step eight – you should have a thick batter which you can dollop from the spatula. Add a little more milk if needed to achieve a dropping consistency. Step nine & ten – peel and chop the apple into 1cm / 1/3″ cubes, and add it and the dried fruit to the batter, and fold in. Step eleven – – pour the mixture into the loaf tin and level with a spatula. Sprinkle the top with demerara sugar or flaked almonds. Step twelve – bake for 40-45 minutes. It’s baked when golden brown on top and a skewer inserted into the middle comes out clean. Finally– allow to cool for 5 minutes. If not using a fully lined tin run a knife around to loosen the cake before turning out. 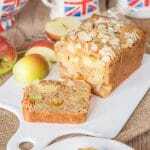 The Dorset apple cake will crumble if you slice it when warm, so its best to allow it to cool completely. Because of the chunks of fresh fruit you need to eat within 2 day, or keep in the fridge for up to 4. My top tip when baking is to use re-usable non stick cooking and cake liners. Buy a roll and cut a piece to fit all your cake pans and you will ever have to cut a cake liner again. They last for years and wash with dish soap under a running tap or go through a dishwasher. 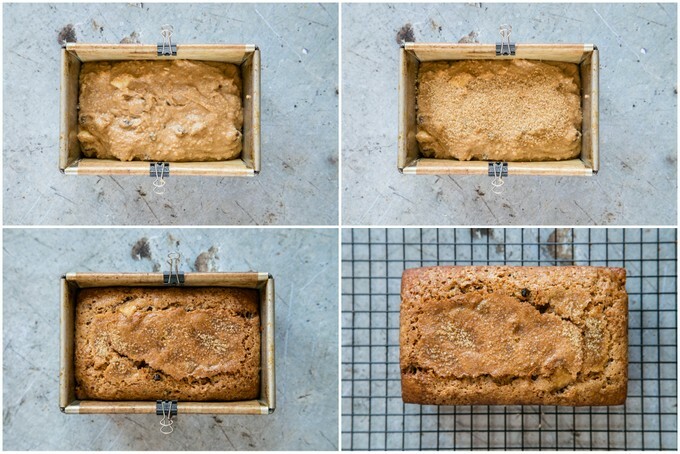 When making a loaf cake you only need to line the long sides and base of the tin. The rubbing in method (where the fat is rubbed into the flour) is traditionally used for cakes with a lower fat content – usually less half fat to flour. Creaming methods (where the sugar is creamed into the fat) are generally used for high fat cakes which have more than half fat to flour. One huge advantage of the rubbing in method is that it is far easier to do by hand without an electric mixer. Vary the dried fruit, or leave it out. The first time we made this Dorset apple cake we used chopped dried apricots in place of the mixed fruit and topped with flaked almonds. Swap up to a third of the flour with the same volume of ground almonds. 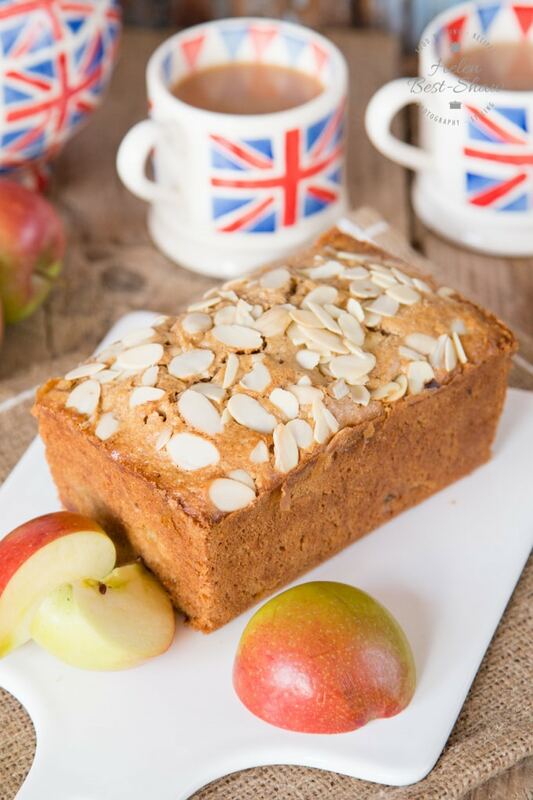 Swap the butter for oil and leave the egg out to make an egg free Dorset apple cake. 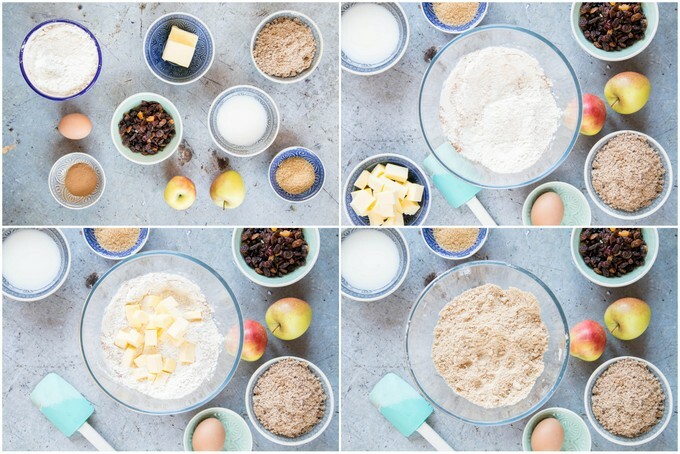 If you try this How to Make A Traditional Dorset Apple Cake please tag #FussFreeFlavours on Instagram or Twitter. It is amazing for me when for me when you make one of my recipes and I really do love to see them. You can also share it on my Facebook page. Please pin this recipe to Pinterest too! Thanks for reading Fuss Free Flavours! Heat the oven to 160°C (Fan)/320°F (Fan)/gas mark 4. Grease and line a deep 15cm (1lb) loaf tin with baking parchment. Mix the flour, baking powder and cinnamon together in a large bowl. Cube the butter and rub it into the flour using your fingers, until it resembles fine breadcrumbs. Stir in the light brown sugar. Break the egg into a small bowl, beat it briefly and then fold into the mixture. Add the milk and fold it in. You want a smooth, thick batter, so if needed, add more milk. Add the dried fruit to the batter. Peel the apple, and cut into 1cm cubes and add to the batter, and fold together. Pour the batter into the loaf tin and level with a spatula. Sprinkle with demerara sugar or flaked almonds. Bake for for 30-40 minutes, until golden and a skewer inserted into the middle comes out clean. Because of the chunks of fruit this cake won't keep for that long, store in an airtight tin for 2 days, or wrapped in foil in the fridge for 4.